When opening a restaurant there are many tasks to complete, such as ordering menus, setting up the kitchen and making a restaurant sign. If the restaurant is located in a shopping center, the center typically has specific rules about what type of sign can be installed. If the restaurant is located where there are no requirements for sign style, then you have the option of choosing a style that bests suits the restaurant’s theme. 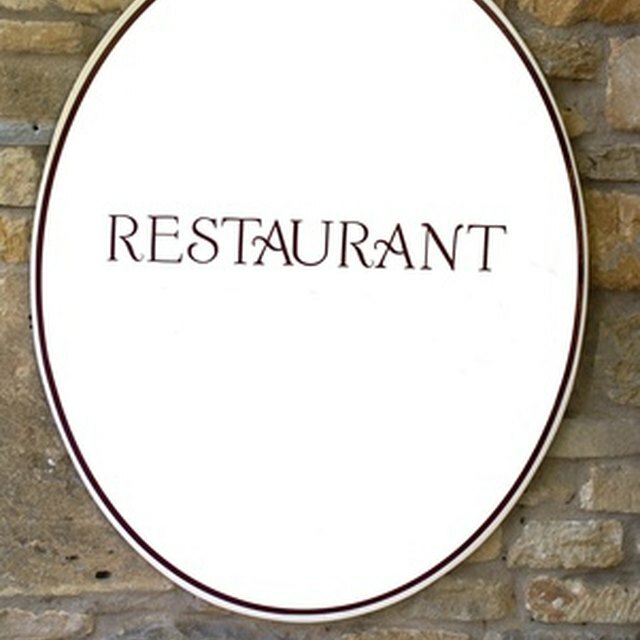 Choose an easy-to-read font for your restaurant sign. Fancy and elegant fonts may be visually appealing, but they can also be difficult to read from a distance. When someone drives by the restaurant sign, you want them to have no problems reading the word or words. Go as large as possible. Local codes will limit the size of your restaurant sign, as will your budget. Make the size as large as your budget allows while staying in compliance with the sign codes. Consider the verbiage for the sign--and it may not be the name of the restaurant. For example, if it is a Mexican restaurant, and the location gets lots of out-of-town traffic, a large sign that says “Mexican Food” may bring in more business than a sign boasting the restaurant’s name. A restaurant with a recognizable name could do better having its name on the sign. Edit your text. Don’t have more than five words on the restaurant sign. When people drive by, it will be difficult to read a sign with more than five words. Light it up. Even if the restaurant only serves lunch, a lit sign will advertise the business in the evenings. Before going electric, consider the additional cost, if there is electricity available to the sign site and what the estimated monthly electrical cost would be to operate the sign. If possible, consider using solar power to light up the sign. Choose the right colors and maintain contrast. If you choose two colors (one for the background and one for text) that are indistinguishable to a color blind person, the sign will be difficult to read. Dark letters on a light background are easier to read. Add a border around the sign. According to the State University of New York, Small Business Development Center, studies show that a border around a sign makes the sign 26 percent faster to read than a sign without a border. Keep sufficient blank space on the sign. According to the Small Business Development, industry guidelines recommend 30 to 40 percent of the sign be blank.